It's the beginning of a new month, time for some more pie charts. Luxury was higher than normal this month because of a trip to Houston to visit my parents. Gas was up for the same reason. It was a very enjoyable trip, and it really didn't hurt that bad. I put off making a larger payment on my credit card, and I didn't save as much this month. 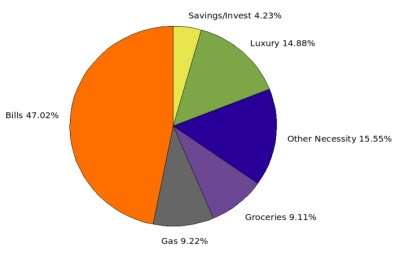 Speaking of savings, I combine savings and investing. I don't know if that's the way to go, but both represents money I'm setting aside for a long term. The only investing I'm doing is Prosper, which is something I learned about on another blog. I'm sure I'll have a post on my Prosper experience later this month. The only reason Other Necessity even exists this month was because my converter went out in the trailer. I'm proud to say I didn't have to put it on a credit card, I was able to pay for it out right.